A particulary important and still contentious discovery is Archaeopteryx lithographica, found in the Jurassic Solnhofen Limestone of southern Germany, which is marked by rare but exceptionally well preserved fossils. 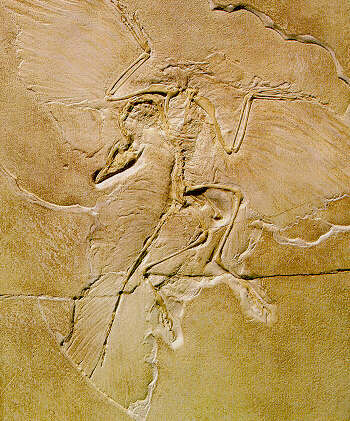 Archaeopteryx is considered by many to be the first bird, being of about 150 million years of age. It is actually intermediate between the birds that we see flying around in our backyards and the predatory dinosaurs like Deinonychus. In fact, one skeleton of Archaeopteryx that had poorly preserved feathers was originally described as a skeleton of a small bipedal dinosaur, Compsognathus. A total of seven specimens of the bird are known at this time. It has long been accepted that Archaeopteryx was a transitional form between birds and reptiles, and that it is the earliest known bird. Lately, scientists have realized that it bears even more resemblance to its ancestors, the Maniraptora, than to modern birds; providing a strong phylogenetic link between the two groups. It is one of the most important fossils ever discovered. Unlike all living birds, Archaeopteryx had a full set of teeth, a rather flat sternum ("breastbone"), a long, bony tail, gastralia ("belly ribs"), and three claws on the wing which could have still been used to grasp prey (or maybe trees). However, its feathers, wings, furcula ("wishbone") and reduced fingers are all characteristics of modern birds. Designed by Y Yang. Suggested resolution,1024x768 or greater.